Perennial onion bulbs (shallots, potato onions, and other multiplying onions) and garlic bulbs store very well over the winter provided that they are well-cured, dry, well-ventilated, and not packed over 4 inches deep. See our earlier post on HARVEST AND CURING to learn how to harvest and cure your garlic and perennial onions for optimal storage quality. Ideal conditions are a temperature between either 32-40°F or 50-70°F with 60-70% humidity. Commercially grown garlic is stored in the dark at about 32°F and 65% humidity. Depending on the species and variety, the bulbs may last six months or even longer. Garlic will sprout prematurely if kept between 40-50°F (the temperature of many refrigerators). You can use an unheated room in your house, a root cellar, your garage, etc. Most varieties store reasonably well in a cool room if hung from the ceiling in mesh bags, or spread on shelves in a layer less than 4 inches deep. Don’t Just Forget About ‘Em! Inspect stored perennial onions and garlic once a month or more often. 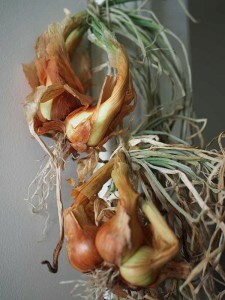 Remove bulbs which have sprouted or spoiled or else the whole batch may spoil. The larger multiplier onion bulbs should be eaten or planted in the fall because they have a tendency to sprout easily. Large perennial onion bulbs may also be grown in pots or flats in your home during the winter, and used as a source of greens all winter long. Keep the smaller bulbs for kitchen use. Well-cured and -stored bulbs may keep all the way through to the following year’s harvests. For seed garlic, ideally select large, well-formed bulbs with good wrappers. If your bulbs aren’t high quality — e.g., the wrappers don’t fully cover the differentiated cloves, you can still plant otherwise well-formed cloves.